Picture this: You're at a white sand beach with the full moon hung high in the sky glistening over the clear, cool water. Now bring into picture thirty thousand people from different parts of the world, covered in neon dancing to pop classics, hip-hop, reggae, rock and much more! Sounds like the perfect place to party? It sure is! 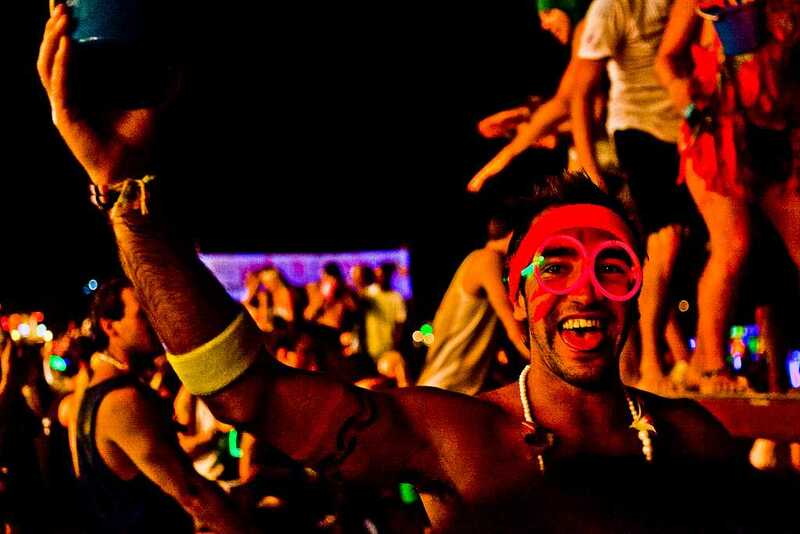 The Full Moon party in Thailand attracts thousands of backpackers every month for the wildest party in the world. To answer all your questions about the Full Moon party, we've created a guide for you so that you're all prepared for the best night of your life! What is the Full Moon Night Party? The first Full Moon party took place in 1985 at Paradise Bungalows in the Ko Pha Ngan Island to thank 30 travellers. Since then it has gained fame, and now around 30,000 tourists gather together at the Ko Pha Ngan Island every full moon night to party. This dance music festival takes place on the beautiful Haad Rin Nok beach. The party carries on an entire night until the sun rises the next day. The party has an entry fee of THB 100. The best time to go to the Full Moon party is from February to April, as it starts getting hotter during May and starts pouring from November. If the Full Moon party coincides with a Buddhist holy day, the party is usually postponed by one day. 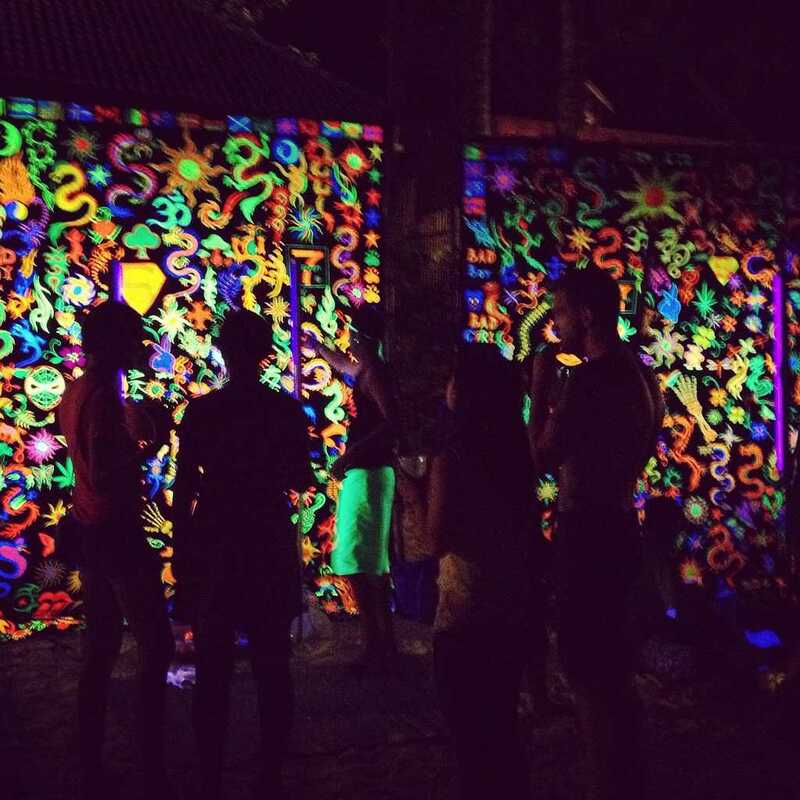 How to Reach Full Moon Party Koh Phangan? By Air: The nearest airport to the island is the Koh Samui airport which has frequent flights from Phuket, Bangkok and Pattaya. You can take a ferry to the island from Koh Samui. By Train: You can take a train from Hualamphong station in Bangkok to Surat Thani from where you'll quickly get a ferry to the island. By Water: You can take a catamaran from the major locations in Thailand such as Bangkok, Phuket, Koh Samui, Koh Tao, Chumphon to Ko Pha Ngan. The catamarans also have pick-up facilities from the hotel. Lomprayah offers free land transfers if you pre-book the tickets online on their official website at http://www.lomprayah.com/. The prices for Lomprayah range between THB 300 to THB 1350. Where to Stay For the Full Moon Party? The minimum stay at Ko Pha Ngan is for 3 to 7 days during the full moon night parties. You cannot stay just for a day, so it is better to stay Koh Samui, which is a neighbouring island and travel to Ko Pha Ngan at the night of the party. You can even choose to stay at Koh Tao Island and then take a ferry on the day of the party. There are many hostels you can choose to stay at. Koh Tao Central Hostel is an excellent place to stay and is also affordable. It will cost you around THB 342 per person. The transit from both Koh Tao and Koh Samui to the island is about one and a half hour. A ferry is a premier way to travel to Ko Pha Ngan. Although the speedboats might be a quicker way to travel, they're not safe, especially during rough waters. They're overcrowded and do not have any safety equipment, so ferry is a much better option. You need to book the ferry tickets (including the return ticket) in advance. A ferry ride will cost you approximately THB 340. What to Wear to the Full Moon Party? You cannot be at the Full Moon party unless you're dressed head-to-toe in neon. Dress in brightly coloured clothes. You can buy clothes from numerous shops selling the Full Moon party attire. A Full Moon night party is incomplete without body and face paint. There are artists who will paint designs on your body. You can also choose to wear neon bunny ears, green masks or neon flower crown, whatever goes with your vibe! Once the sun sets and the moon come out, the Haad Rin Nok beach transforms into a neon battlefield. There are dozens of bars lined up at the beach featuring international and local DJs. From fire dancers and dance stages to skipping on fire ropes, this party gets wild. At the Full Moon party, the drinks come in colourful plastic buckets which cost around 300 THB. This bucket includes a can of soda, some ice, a Thai version of a Red Bull, 300 ml bottle of vodka and a few straws. It is advisable to share this bucket with your friends as the contents of the bucket are not meant to be just for one person. The party is in full swing at 22:00, which is the best time to arrive. There are different genres of music up and down the beach with excitable displays such as the fire limbo. You might be tempted to skip on the fire ropes, but it is advisable to stay away from them as it might lead to severe burns and injuries. So leave the fire ropes to the professionals. It's not uncommon for the partygoers to have their valuables stolen. Do not carry any bags as you might lose it or forget it somewhere. Just take your phone and minimum cash for food, drinks and travel. Make sure you carry change as you will need to pay around THB 10 to use the restrooms. You might want to hang on tight to any electronics you decide to bring to the party. It is best to carry a photocopy of your passport and leave your original passport and other essential things locked up in the hotel safe. Make sure you ask for a receipt when you use the hotel's safe. Drugs are illegal in Thailand, and you should stay away from it, no matter what anyone says. Thailand has super strict anti-drug laws. There are undercover police inspectors on the lookout for drug offenders. Do not indulge in this as you will get arrested and will have to pay a humongous fine. Don't walk barefoot or in flip-flops on the beach. There might be shards of glasses from broken bottles in the sand. It is very easy to step on broken pieces of glass and plastic. However tempting it might be, do not step in the water as it has sharp rocks and corals and you might cut yourself. Also, some people choose to empty their bladders into the ocean, so stay away from the water. Make sure you have your return ferry ticket to whichever island you've chosen to stay at. Have some juice, water and snacks stacked up in your hotel room before you leave for the party so that the drunk you will be thankful for the sober you the next morning. Sing at the top of your lungs, dance until the sun rises, cover yourself in body paint and bond with all the new travellers you meet! Sunsets In Koh Samui - 3 Beaches To Visit For A Mesmerising View Of Sunset!